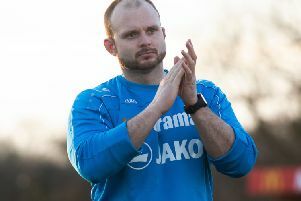 Hemel Hempstead Town manager Dean Brennan was in buoyant mood following his side’s Herts Senior Cup final triumph – saying that he is relishing the challenge of taking the Tudors forward next season. The Hemel boss was visibly deflated following Saturday’s defeat to Bishop’s Stortford which ended Hemel’s hopes of reaching the Conference South playoffs, but he said he was thrilled by his team’s response last night. “We’re delighted – It’s great to win another competition and get back to winning ways because it becomes a habit,” he said. “I thought that what we did really well was we matured and managed the game excellently; I keep talking about being able to manage the game because it’s so important at this level. “If I’m being honest, I haven’t slept for the last three or four nights since Saturday – I was still feeling it this morning, but I’ve got to get on with my job and lift the players and that’s what we’ve done today. “Some of the senior players have really helped – players like Dennis Oli, Ed Asafu-Adjaye and Eddie Oshodi, they’ve been excellent even though we have all been disappointed. “We are looking forward to next season, really, we can’t wait now. Brennan was full of praise for his players after the game on Tuesday night, highlighting excellent displays from the spine of his team. We are looking forward to next season, really, we can’t wait now. “I thought we defended really well and I don’t think they really had a chance in the game,” said the Tudors boss. “We didn’t have many chances either but their keeper made a fantastic save in the second half from (James) Simmonds. “To be fair to Parkesy, what a free-kick it was; 30 yards out and he bends it right into the corner. “They have good players and they can hurt you, but we restricted them and counteracted the way they play by setting out in the formation that we did. “I thought Matty Harriott was excellent and Dom Hyam was outstanding. The spine of our team was excellent – Nicke Kabamba showed little glimpses of what he can do, and our substitutes all came on and made a big contribution to the game. Next up for Hemel is a trip to playoff-chasing Whitehawk on Saturday.